I wanted to write about this album last week, but I still hadn’t fully listened to all the songs so I’m glad I waited. I absolutely love listening to Adele sing. 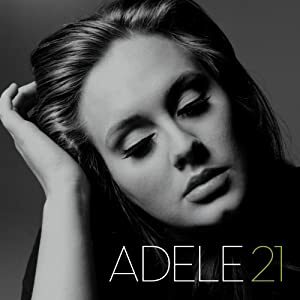 And I talked about Adele a while ago with her awesome song “Rolling in the Deep” so if you liked that song, I highly recommend you check out the rest of her album. Since the album starts with “Rolling in the Deep” we’ll just move on to my favorites. I do like all of the songs, but as usual, I like more songs than others. “Rumor Has It” and “Turning Tables” are nice, but I tend to skip them to get to “Don’t You Remember.” While the whole album really showcases her vocal talents, there’s just something about this song that makes me keep playing it over and over again. This may have been the song I felt was Sam Cooke-ian. It just has a classic vibe to it. (I will have to update this later, because I can’t remember exactly what song has this specific classic sound, but she is overall a very soulful singer, which is why it’s hard to pick which song shows the best example.) But again, it’s her voice I love in this song. Before I go on, the album is titled 21 because she was 21 at the time she wrote all these songs, just like her album 19. And during this year in her life, the majority of her songs are about a breakup, the before and after of it. Not all of the songs are sad and depressing or whatever you would relate to a breakup, and I’ll tell you which one(s) I didn’t have that feeling towards. “Set Fire to Rain” is a song that’s beginning to grow on me as well as “He Won’t Go” which has a nice uptempo beat to it. It had a very slight Lady Gaga vibe, don’t look too deeply into finding it, because it could just be my own ears. Either way, I like it. “Take It All” has a beautiful piano arrangement, but I really like this song. “I’ll Be Waiting” is a good song, but honestly I skip it to get to “One And Only” which may be my most favorite song on the album. This is the song I feel isn’t a sad or depressing song, and it doesn’t sound like a breakup song. It has different levels to it too. You just have to hear it to understand. When I’m not hitting repeat, I happily let “Lovesong” play through. This also doesn’t sound like a breakup song to me, more like a lovely, peaceful ballad of love. Perhaps a memory of better times. Then the album concludes with “Someone Like You” which is a very personal and specific song, which interestingly some people including myself can relate to. It’s a very beautiful song, even though it’s a sad one. I listen to this over and over again due to her beautiful voice, the lyrics, the overall music of this song just grabs my heart. I admit, it almost made me cry, not for the meaning of the song, but the feeling the music gave me. The album I have has bonus tracks including some live performances. If you can get that version, I highly recommend it. It might be on iTunes, I don’t know, it was a gift to me. “If It Hadn’t Been For Love” is the song that sticks out as being the most awesome of the bonus tracks, besides the live versions of “Turning Tables” “Don’t You Remember” and “Someone Like You”. Anyway, she’s joining the ranks of my other British soul love, Joss Stone. ‹ where’s the pause button?